Christmas cracker jokes: officially, the least funny thing in the world. Or that’s what we thought until we saw Amazon’s new Posts for brands feature. Here’s the screengrab they’ve featured on their promo page. We’re imagining it’s a bit of a rush job because one of the posts talks about tweeting, yet there doesn’t seem to be any Twitter integration (can I get a #fail?). Anyway, for some unholy reason, Amazon seem to think that the ability to add 140-character micro-blogs to your brand page (and have them syndicated to your Facebook page because, sure, that’s the right way around) is going to: “Make the link between your social content and retail success”, “align your social marketing efforts with your e-commerce objectives”, “bring a social element to your Amazon.com presence” and, weirdly, “drive traffic to your products on Amazon.com” – even though these posts are going to be published on Amazon.com to start with. Predictably, over-excited pundits are dubbing this “social commerce” but, really, it’s nothing of the sort. It’s tagging some status updates onto a landing page, then pushing them to Facebook. That’s at best social marketing; at worst, it’s another time-consuming thing brands have to worry about doing now. We’re happy to keep saying this over and over again: social commerce means people shopping socially. It doesn’t mean social marketing for retail. 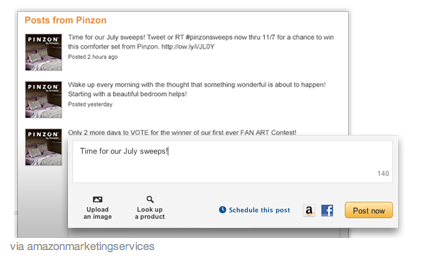 So pop-up stores, Pinterest deal boards and Twitter sweepstakes are not social commerce. Real engagement, where customers are empowered to have a say in what goes on sale and how, where people are incentivised and rewarded for sharing and shopping along with their friends? That’s social commerce. So, happy Christmas, Amazon – but we think this one’s a bit of a turkey.